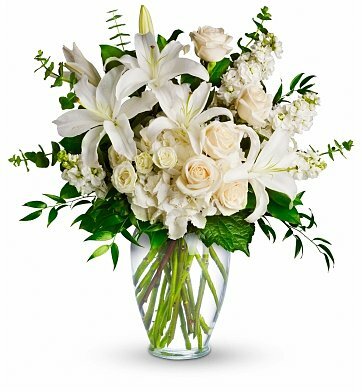 A lovely bouquet to soothe and comfort, this soft-toned arrangement is a graceful gift for any occasion. White and peach blossoms such as hydrangea, spray roses, stock, roses, eucalyptus, and more fill a tall glass vase. Fragrant and touchingly elegant, the bouquet is made with premium flowers to make a lasting impression. Dreams from the Heart Bouquet is a hand delivered gift. These gifts are delivered by one of our local design centers located throughout the United States and Canada. Same day delivery is available for most gifts when ordered before the cutoff time. The cutoff time for Dreams from the Heart Bouquet is 12 PM in the recipient's time zone. I ordered an arrangement the day before for my sister-in-law's celebration of life service. I tried another online company first that I usually use, but I could not be guaranteed that the flowers would arrive in time for the 11 am service. They arrived in plenty of time and were gorgeous! I think this will be my 1st Stop from now on. Thank you! The family that this was sent to said they were beautiful. I did not see them personally, so I am only going by what was said by the recipient. Our friends in New Jersey were very impresses with this lovely bouquet, sent from Australia for their wedding!! I received a very nice feed back from the recipient - thank you!